I was really excited to read Warbringer but I also not sure what to expect. I loved Wonder Woman since I was a kid and watched the Linda Carter series so I wasn’t sure if I could wrap my head around Wonder Woman being a young adult. Of course as always, Leigh Bardugo delivered an awesome novel. I love Leigh’s writing in her fantasy series and the Grishaverse she created. I was really curious about how it would be to have her write something a little more contemporary. Although Wonder Woman is obviously Superhero realm, it still occurs in the real world. I felt like she did not miss a beat. Her writing was flawless and I love the way that she can keep a story moving. The continuity and pacing flowed very easily. I thought the way this story was slipped into the Wonder Woman cannon was extremely clever. It fit into the universe but also managed to be it’s own standalone story. I loved the plot and the inclusion of the character of Warbringer. I felt invested in the cast of characters, which of course caused more emotional damage to me when anything happened to them. It definitely had the action and adventure you would expect from something involving a Superhero. I don’t want to give anything away on it because I loved going into it not knowing what to expect and coming out the other side completely in love with the book. We also had some great settings and lore to add to my overall image of the world. It was great to spend some time on Themyscira. Getting to know other Amazons besides Diana. Also having a little bit of her own origin story. It gave so much more to knowing about Diana and her character. 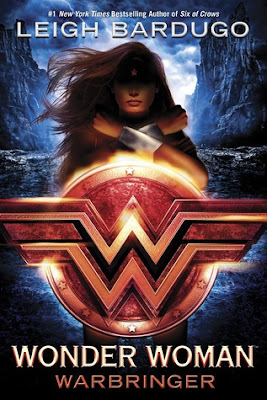 So as a Wonder Woman fan, I loved the book. I would definitely recommend it to other Wonder Woman fans. It doesn’t matter if you have been following her from the beginning or just recently fell into her story. I think this is a book to be enjoyed by everyone. I totally agree. I am also a big Wonder Woman fan and I like how it worked with the character's canon but didn't get bogged down in explaining it. It wasn't an origin story, it was it's own independent thing and it was great! Great review! Bạn có thể dễ dàng truy cập vào chơi casino online fun88 khi bị nhà mạng chặn thông qua rất nhiều đường link mà nhà cái bóng đá fun88.com cung cấp, đảm bảo lúc nào cũng có thể truy cập ổn định không bị gián đoạn.